Adding shine to nails this Spring/Summer 2017 season. 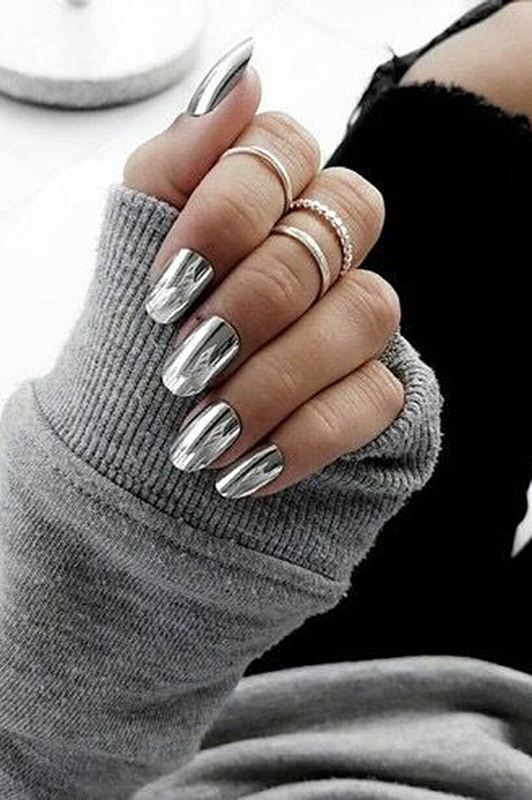 Chrome, or simply mirror shine, nails have already taken Internet by storm. And this popularity already ensured the chrome effect with a place among leading trends of 2017. Mirror shine manicure doesn't come as a strong runway trend, but rather a trend that saw its rise thanks to Instagram and Pinterest (okay, also Gigi Hadid). Well, we have nothing against such scenario because this manicure looks super cool. And while this effect is easier achieved by manicure pros, InStyle.com shares an advice how to do it at home by yourself (might not turn to be as easy as one thinks). Meanwhile, you can still have a go with Sally Hansen's Miracle Gel or nail wraps to get those chrome-like nails (also thanks to InStyle).